In the wild, a bird's normal activities keep the nail growth and nail wear balanced naturally. However, in captivity, a bird's toenails seldom are exposed to the same abrasive wear as in the wild. Keeping our bird's nails and beak properly trimmed is less about good grooming and more about health, comfort and safety. Overgrown nails makes perching and climbing difficult and uncomfortable. Nails that are too long can get caught in objects preventing the bird from flying freely and causing certain death. 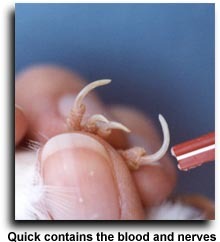 Human fingernail clippers will work on small to medium sized birds while dog nail clippers can be used on larger birds. Other essential tools are styptic powder, silver nitrate, iron sulfate or if you are going to release your birds into an outdoor flight, I would suggest you use a match or cigarette lighter to guarantee stopping any bleeding that may occur. Cutting the nails is simple on birds with white-light toenails like the Gouldian. 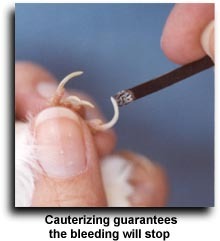 Each bird nail has a �quick� � the living portion of the nail that contains blood and nerves. You can easily see the �quick� on the Gouldian because their toe nails are white. In white � light colored claws, the quick appears as a pinkish stripe that grows partway down the center of the nail. To find the quick in dark claws, turn the bird over to examine the underside of the claw. It is best to pare off a little at a time, so that you do not cut into or expose the nail's quick. If the quick is cut, the nail will bleed profusely and cause the bird pain. The bleeding must be stopped immediately. If you can see the quick, snip off the nail just below it. If you can't see the quick, begin by cutting only a tiny amount from the nail, continue until you've trimmed the nails to their proper length. Blood Stop Powder - 100% Natural Purified Kaolinite used to stop bleeding from minor cuts, wounds or over trimmed toenails and feathers. If you are going to release the bird back into a large flight or aviary, I suggest you use a match or cigarette lighter to guarantee the bird doesn't knock off the blood clot while flying from perch to perch. Sometimes heat is needed to stop really stubborn bleeding. Cauterizing the nail will absolutely stop the bleeding. It will also not leave a clot that could be knocked off. Using a match stick lite the match and allow it to burn for a couple of seconds, blow it out and immediately press it firmly to the tip of the nail. Hold it there until the match cools. The tip of the nail should be charred, if not repeat the process. If the bird has lost an appreciable amount of blood, it should be kept at 80-85 degrees in a covered cage to keep the bird quiet for a few hours. It would help to give the bird NV Powder while in the cage and for several days after it is released back into the cage. NV Powder will help it get over the stress and shock of blood loss. Just like your bird's toenails, his beak grows continually. Most birds will wear down their beaks naturally and will never need you to trim them. Periodically, thin splinters will chip off the tip of the beak. Sometimes you will see large and small thin, scaly pieces on the beak. This is a normal part of the renewal of the beak's tissue. Some birds have abnormal or excessive beak growth or do not align correctly. In such cases the bird is hampered in its intake of food. If nothing were done to help, eating would eventually become impossible. Your avian veterinarian would be the best one to determine whether or not your bird's beak should ever be trimmed. You will find after you start using great supplements your bird's toe nails and beaks will grow even faster than normal. Nail growth is supported by exactly the same nutrients that promote feather production. The amino acids (and sulphur) are the main contributors to nail and beak growth. Often just using a calcium supplement will also increase nail growth which highlights how often calcium is deficient in traditional diets. Feathers, of course, will only grow when the bird decides to molt. Beaks and nails will grow continuously. It was very difficult for me to keep up with all the trimming required with the number of birds that I own. I started to search for an easier solution. I found that the concrete and sand paper perch covers that other breeders recommended irritated my birds little feet. I contacted the Sandy Perch Company and started using their manzanita core perches. I found the perches provided the birds with a safe trimming source for both nails and beaks that regular dowel rods and tree branches don't provide. Plus they do not irritate the birds feet like the concrete and sand paper covered perches. The one problem I found with the Classic Perch was that the sizes the company manufactured were all too large for my finches. The company agreed to design and manufacture specifically for us the �finch� size perch. They are narrower in diameter than the standard mini and small on the market. We also offer the Mini-Mini. It is only 5 inches long and perfect for a bird�s favorite roosting spot high up in a cage at night. I use all sizes in my flights and cages. My birds love them and I never need to trim beaks and nails, so I LOVE them!